Growing up in a fairly strict and conservative first-generation Korean home in the United States, we were taught we shouldn’t discuss any of our issues outside the home. We are a culture that feels we must suffer in silence, for it is disgraceful to be so open about our challenges in public. Unfortunately, this is the mindset of the majority of Asian-Americans today. For me, to be so open about my son Zephaniah’s autism spectrum disorder (ASD) diagnosis has gotten me verbally ridiculed and criticized by my community. People ask me, “Why are you talking openly about it? Shouldn’t you be embarrassed?” as if it’s some dirty little secret. I was thrilled when I met another Korean-American mother whose teen son was on the spectrum as I wanted advice. I was taken aback, however, when she admonished me in public when I mentioned my son’s autism so candidly. Another time I tried to reach out to a Korean-American family whose child was recently diagnosed, but they refused my help and pushed me away. It’s disheartening to witness many still hold on to these mindsets today. Yet, Asian-Americans love to pride themselves in and even brag about which schools they got into or how successful their careers are. The problem arises when a child’s disorder becomes a direct contrast to our definition of success. So many people focus on a child getting top scores on the SATs, which colleges he/she was accepted to, and what career he/she will land later on in life. We don’t seem to have any issues when asking for help if it furthers our child’s academics or career. But when it comes to autism, doors are shut and the silence becomes deafening. 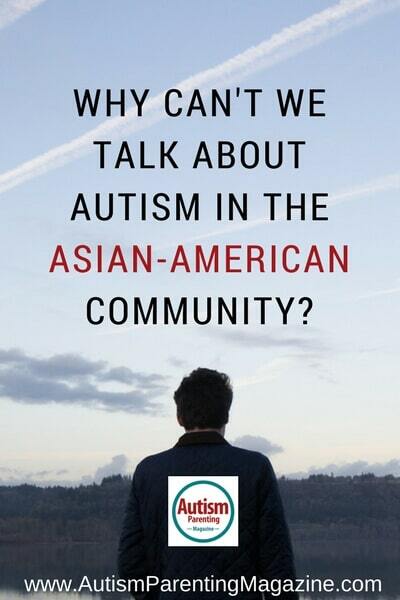 Autism is still a relatively new condition in the Asian community. It has been described as a complex neuro-behavioral condition with impairments in social interaction and speech/communications. I was surprised how a lot of parents from my generation of X-ers, and even Millennials, did not know much or anything about autism. They’ve maybe heard about non-Asians having autism, but never encountered an Asian child with it. The Centers for Disease Control and Prevention states that 1-in-68 kids in the US are diagnosed with ASD. Yet, in Asian-American households, less than one percent of those with ASD are being treated. It is that one percent, probably less, that gets help and treatment, but what about the rest? There are times that I wish my child was typical, especially when I’m having a very rough day. My son Zephaniah was diagnosed with ASD when he was around three years old, and most people who come in contact with him seem to downplay the struggles of our day-to-day lives. Some of the comments I hear are, “He’s a mild case,” or “There’s no need to worry because he’s so smart,” and the one that gets me angry the most is, “He doesn’t look autistic.” Do people with ASD look a certain way? There’s a saying in the autism community that “when you meet an autistic kid; you only meet one autistic kid,” because everyone on the spectrum is unique, there wasn’t any paradigm that completely matched everyone. I am aware there are other families who have it tougher than we do, but it doesn’t diminish my own challenges and struggles that I have with him. Trying to deal with his very black and white view of the world and trying to explain the gray areas in life can be frustrating. For example, the sky literally isn’t falling when his sister accidentally knocks over his LEGO-brand cars. I became a little concerned when Zephaniah’s speech was a little delayed. He was two years old and wasn’t speaking clear sentences yet. I brought up the concerns to his pediatrician, but she believed it was due to the different languages being spoken in the house: English and Korean. She wasn’t alarmed because he was a bright and happy boy. So she suggested that we only limit speaking English and maybe he would eventually grasp it. When he was three, we began seeing a speech pathologist and she immediately noticed those certain mannerisms that were common to children with ASD, such as lining up toys and his rigidities in schedule, and suggested we have a psychologist evaluate him. I always knew that he was a little “different” as he gravitated to a particular Star Wars graphic novel, and began lining up his foam letters and toy trains. We thought he was just being particularly “quirky” because he excelled in other areas. He knew how to operate an iPad, video games, and became fixated with how washing machines functioned. His pediatrician even acknowledged that he had gifted aspects which would account for those behaviors. Once my son was diagnosed our lives changed. My husband was in denial and I cried for the first 24 hours. After that, I dove head first into researching everything there was about autism. I became obsessed trying to find out the causes and explanations. At first, I trusted the doctors completely but soon realized that their methods weren’t working, so I had to take matters in my own hands. I needed to take everything the doctors were saying with a grain of salt. There wasn’t going to be a “one size fits all approach” in treatment, or that the “homework” strategies were going to be the same for every child. I knew my son better then they knew him, so I searched for more specialists and devised my own strategies on how to help him cope. As he got older, my son’s anxieties began to increase. He had a period of night terrors and did not want to be left alone when he slept. He experienced panic attacks when my husband dropped him off to preschool because he couldn’t acclimate to a new environment. That was a very dark period in my life. I didn’t know if he was ever going to get through this. I didn’t think the therapies were going to work. I was shuttling him to the University of California, Los Angeles (UCLA) four times a week, also trying not to neglect my youngest child, Zoe, as I had her in tow. My husband became more reclusive and depressed as he had a hard time coping and dealing with Zephaniah’s condition. I was also concerned about Zoe’s feelings, because she felt excluded from these therapy sessions and thought he and I were having fun without her. I felt completely alone because I had no help from my husband or other family members. I felt my family was unraveling and we were sinking fast. I knew that the divorce rates for families with a child with special needs were high, and I thought that we were going to be another statistic. I began feeling ashamed, embarrassed, and reclusive. I thought by hiding behind this wall I was protecting my son. Life is ugly and messy, and I needed him to learn how to be resilient and to maneuver through the darkness. So I decided to go against everything that my culture taught. Even my own mother encouraged me to keep his diagnosis in the closet. I knew that I wasn’t the only Asian mother out there suffering; but I knew they were silent. If I placed myself out there, maybe, just maybe I would be able to encourage other moms who were struggling like me. I knew that I was going to get pushback from people in my circle/community that weren’t going to embrace me with open arms. This was going to be a steep mountain to climb. The risks were going to be rather high, but the rewards were going to be much greater. I realized my son would not progress if I just sat on my hands, soaked in self-pity and did nothing because that is not productive. I wasn’t going to allow the label to define me or my son. So I enrolled both of us in several programs at UCLA. When I would take him to his group therapy meetings, I noticed that I was the only Asian parent and thought it was odd. I inquired as to how many Asian parents participate and was surprised that their response was not many. They informed me that there are less than one percent of Asians who are being treated and evaluated in these clinical studies. It’s a sobering thought knowing that 99 percent of Asians who probably are on the spectrum are going undiagnosed. I believe the overall issue to explain the low attendance is guilt and shame. I strongly believe we can make inroads in the autism community if we are able to let go of that closed-off mentality that plagues our culture. Instead we push everybody away; we put up walls because we are afraid that we would be a disappointment. We as Generation X-ers grew up in a very immigrant mentality which we hated as children, enrolling in many Advanced Placement (AP) classes, Korean-schools, Kumon programs, and SAT-preps. As I reflect upon my upbringing as an immigrant from Asia, we are doing the exact same thing that we loathed; we are doing it right back to our kids. We have not improved with each generation. Our parents came here looking for the American dream: to be financially successful and provide better opportunities for their children. Sadly, those dreams are shattered when a child has special needs. We can achieve so much more if we remove this immigrant mentality: work hard, keep your head down, and don’t challenge the status quo. We need to get past those emotions, see past ourselves, and realize that it is not about you; it’s about your child having to maneuver through this topsy-turvy world with these blinders on. As caretakers, our emotional baggage is the size of a U-Haul and at times can be too heavy to bear. This is why a community is so important to help carry those burdens. We need to nurture a sense of resilience, tolerance, and self-acceptance in ourselves, empower those who suffer in silence so that we can have a new beginning. We only have one life to live, so why not live the way you want the world to become instead of living in defeat? At the end of every day I like to unwind and watch comedy specials. I came across this comic named Hasan Minhaj. In his comedy bit he quoted something that resonated to my core: Your courage to do what’s right has to be greater than your fear. I hope we will all find the courage to do what is right and no longer live in silence. Sunny Jang was born in South Korea but moved to the US when she was a year old. She was raised in a very strict and traditional Korean home, where “saving face” and “honor” were just as important as “good manners” and “obeying the law.” She holds a second-degree black belt in Tae Kwon Do and a black belt in Fashion! Sunny met her husband in high school and they married for about 10 years after graduation. Their son, Zephaniah, was born about 14 months later and was diagnosed with autism when he was three years old. Since his being diagnosed, Sunny has made it her life mission to ensure he is able to navigate through life and to not have his diagnosis define who he is or wants to be. Sunny is saddened by many in the Asian-American community not seeking the necessary support and therapy help because of feelings such as guilt and shame. She hopes their children can have the same opportunities for success, and it’s the reason why she advocates for others, so that they, too, can find their voice and no longer suffer in silence. Sunny Jang was born in South Korea but moved to the US when she was a year old. She was raised in a very strict and traditional Korean home, where "saving face" and "honor" were just as important as "good manners" and "obeying the law." She holds a second-degree black belt in Tae Kwon Do and a black belt in Fashion! Sunny met her husband in high school and they married for about 10 years after graduation. Their son, Zephaniah, was born about 14 months later and was diagnosed with autism when he was three years old. Since his being diagnosed, Sunny has made it her life mission to ensure he is able to navigate through life and to not have his diagnosis define who he is or wants to be. Sunny is saddened by many in the Asian-American community not seeking the necessary support and therapy help because of feelings such as guilt and shame. She hopes their children can have the same opportunities for success, and it's the reason why she advocates for others, so that they, too, can find their voice and no longer suffer in silence.